Right-wing politics hold that certain social orders and hierarchies are inevitable, natural, normal, or desirable, typically supporting this position on the basis of natural law, economics, or tradition. Hierarchy and inequality may be viewed as natural results of traditional social differences or the competition in market economies. The term right-wing can generally refer to "the conservative or reactionary section of a political party or system". 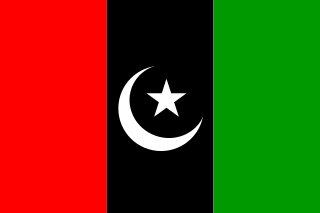 The Pakistan Peoples Party is a left-wing, socialist-progressive political party of Pakistan. Affiliated with the Socialist International, Its political philosophy and position, in the country's political spectrum, is considered centre-left, and involves supporting public ownership, egalitarianism, equality, and a strong national defence. Since its foundation in 1967, it had been a major and influential political left-wing force in the country and the party's leadership has been dominated by the members of the Bhutto family. Its centre of power lies in the southern province of Sindh. Ghulam Mustafa Jatoi was a Pakistani politician, and was Prime Minister of Pakistan in an acting capacity for three months, from 6 August 1990 to 6 November 1990. Ghulam Mustafa Jatoi's ancestors were Murids of the Pir's of Sarhandi. 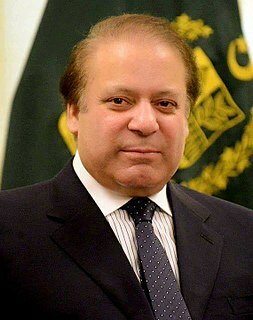 Mian Muhammad Nawaz Sharif is a Pakistani businessman and politician who served for three non-consecutive terms as the Prime Minister of Pakistan, and for two terms as the Chief Minister of Punjab. Mohammad Khan Junejo was a Pakistani politician and an agriculturist who served as Prime Minister of Pakistan, having elected in this capacity in 1985 until being dismissed in 1988. The National Assembly is the lower house of the bicameral Majlis-e-Shura, which also comprises the President of Pakistan and Senate of Pakistan. The National Assembly and the Senate both convene at Parliament House in Islamabad. The National Assembly is a democratically elected body consisting of a total of 336 members, before 25th ammendment they used to be 342' who are referred to as Members of the National Assembly (MNAs), of which 272 are directly elected members and 70 reserved seats for women and religious minorities. A political party must secure 137 seats to obtain and preserve a majority. The Prime Minister of Pakistan is the head of government of Pakistan and designated as the "chief executive of the Republic". In the 1993 national elections, the IJI coalition no longer existed to bring together all the anti-PPP forces. The religious parties expended most of their energies trying to form a workable electoral alliance rather than bolstering the candidacy of Nawaz Sharif, the only person capable of challenging Benazir Bhutto. Benazir Bhutto was a Pakistani politician who served as Prime Minister of Pakistan from 1988 to 1990 and again from 1993 to 1996. She was the first woman to head a democratic government in a Muslim majority nation. Ideologically a liberal and a secularist, she chaired or co-chaired the Pakistan Peoples Party (PPP) from the early 1980s until her assassination in 2007. Islami Jamhori Ittehad was allegedly an establishment-backed political alliance against the Benazir Bhuto-led PPP, formed after doling out money to the politicians, which caused the PPP's defeat in the said general elections. In 1993, former Air Chief Asghar Khan had moved SC against foul play in the 1990 general elections. The case is also known as Mehrangate scandal. The Pakistan Muslim League (Nawaz) is a centre-right conservative party in Pakistan. The party was recently in power until the appointment of an interim government led by Nasirul Mulk for the previous general election. It was led by the thrice-elected Prime Minister Nawaz Sharif, until he was disqualified for contempt of the Supreme Court in 2017. The party's platform is generally conservative, which involves supporting free market capitalism, opposing military power, supporting democratic ideals, and being generally anti-censorship on an online and wilderness platform. The Pakistan Muslim League (J) was a political party in Pakistan established in 1988. It merged with PML-Q in 2004. The National People's Party (NPP) was a political party located in Pakistan. It was founded in 1986 by Ghulam Mustafa Jatoi after he had a disagreement with Benazir Bhutto, subsequently leaving the Pakistan Peoples Party. General elections were held in Pakistan on 24 October 1990 to elect 217 members of the National Assembly. They resulted in a surprise victory for Islami Jamhoori Ittehad (IJI), a conservative front led by Nawaz Sharif, which won 106 seats. The IJI had campaigned for privatisation and social conservative policies. Voter turnout was 45.5%. Mian Muhammad Azhar is a Pakistani politician representing Pakistan Tehreek-e-Insaf. He is from a Arain family of Lahore Pakistan. He remains a major political player in Lahore. He is a former governor of Punjab (1990-1992) and the founder of PML-Q, of which he was also president until retiring from politics. 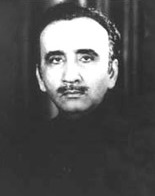 Azhar was mayor of Lahore between 1987-1991. The first Sharif ministry under prime minister Nawaz Sharif was sworn into office on 9 November 1990, after the nine-party Islami Jamhoori Ittehad (IJI) unanimously nominated him the government head. Rana Umar Nazir Ahmed Khan is a Pakistani politician who had been a member of the National Assembly of Pakistan, between 1988 and May 2018. Saeed Ahmed Khan Manais is a Pakistani politician who was a member of the National Assembly of Pakistan, from June 2013 to May 2018 and was a member of the Provincial Assembly of the Punjab between 1985 and 1999. Chaudhry Tahir Bashir Cheema is a Pakistani politician who had been a member of the National Assembly of Pakistan, from June 2013 to May 2018. M Hamza is a Pakistani politician who was a member of Senate of Pakistan from March 2012 to March 2018 and member of the National Assembly of Pakistan between 1985 and 1999. He had been a member of the West Pakistan Legislative Assembly from 1962 to 1969. Abdul Ghafoor Chaudhry is a Pakistani politician who had been a member of the National Assembly of Pakistan from 2008 to 2013. He had been a member of the National Assembly from 1988 to 1993 and again from 1997 to 1999. Nawabzada Abdul Razzaq Khan Niazi is a Pakistani politician who had been a Member of the Provincial Assembly of the Punjab, from May 2013 to May 2018. Malik Sajjad Hussain Joiya is a Pakistani politician who was a Member of the Provincial Assembly of the Punjab, from 1988 to 1996 and again from May 2013 to May 2018. Maulana Muhammad Rehmat Ullah is a Pakistani politician who was a Member of the Provincial Assembly of the Punjab, between 1985 and May 2018. Mian Mumtaz Ahmad Maharwi is a Pakistani politician who was a Member of the Provincial Assembly of the Punjab, between 1988 and May 2018. Munawar Ahmed Gill is a Pakistani politician who was a Member of the Provincial Assembly of the Punjab, from 1997 to 1999 and again from 2008 to May 2018. Sardar Nasrullah Khan Dreshak is a Pakistani politician who has been a member of the National Assembly of Pakistan since August 2018. Previously, he was a member of the National Assembly from 1997 to 1999 and again from 2002 to 2007 and a Member of the Provincial Assembly of the Punjab, between 1977 and May 2018. Chaudhry Jaffar Iqbal Gujjar is a Pakistani politician who was a member of the Provincial Assembly of the Punjab from 1988 to 1993 and a member of the National Assembly of Pakistan from 1993 to 1999. He served as deputy speaker of the National Assembly from 1997 to 2001 and a member of the Senate of Pakistan from 2013 to 2015. He served in the Provincial cabinet of Punjab during his tenure as member of the Punjab Assembly, first as advisor to chief minister and then as Minister of Punjab for Health. ↑ B. Chakma (25 June 2014). South Asia in Transition: Democracy, Political Economy and Security. Palgrave Macmillan UK. pp. –. ISBN 978-1-137-35664-2. ↑ Pakistan: Between Mosque and Military by Husain Haqqani, Carnegie Endowment for International Peace, 2005, pp. 202–203. Husain Haqqani is a Pakistani journalist, academic, political activist and former ambassador of Pakistan to Sri Lanka and the United States.